LITTLE ROCK, Ark. (July 28, 2018) Further tipping the scales to the side of the ASCS Mid-South Region, the third match-up between the Arkansas based series and the American Bank of Oklahoma ASCS Red River Region presented by Smiley’s Racing Products ended with Tim Crawley collecting the $2,000 winner’s check at I-30 Speedway on Saturday night. Grabbing the win from the third starting spot, the Ronnie Pitts Motorsports No. 1x was chased to the line by Tennessee’s Brian Bell. The top finishing driver for the ASCS Red River Region was Alex Sewell, who rolled to the final podium step in a backup car after taking a violent ride Friday night at Creek County Speedway. Cody Gardner finished fourth with Justin Webb making up four spots to finish fifth. Ernie Ainsworth, Charlie Louden, Blake Jenkins, Kevin Hinkle, and Wally Henson made up the top-ten. While the racing was intense, the highlight of the night goes to another Crawley. Organizing Backpacks and school supplies for kids to go back to school for the second week in a row, mastermind Lora Crawley helped to pull together enough support to had out 154 bags full of supplies. 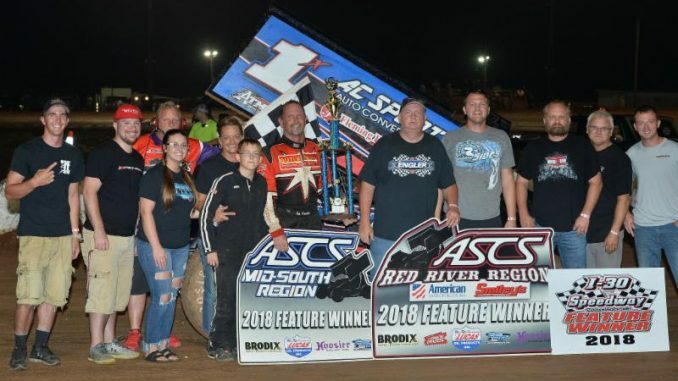 Next up for the American Bank of Oklahoma ASCS Red River Region presented by Smiley’s Racing Products is another showdown with the ASCS Mid-South Region at Jackson Motor Speedway in Byram, Miss. On Saturday, August 11. I-30 Speedway – Little Rock, Ark.